I literally gasped. Year after year after year, and day after day after day, people are hit and killed by Muni while crossing the street. True — not all deaths and injuries are Muni’s fault. But in general, if you see a bus when you have a ‘Walk’ sign, look in all 360 degrees before walking. Doing so is a sign of self-respect. I’m just baffled that the agency feels they need to educate the general public on safety issues. Why not run those banner ads inside the bus … say, in the front seat? Next to the driver. So…it sounds like they’re saying you won’t get run over if you respect the rules of the road. 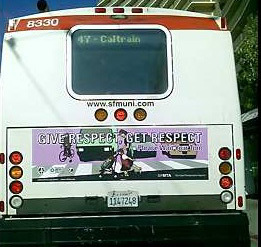 That means you shouldn’t fear for your life when Muni runs a red light to make that stop across the street on time?